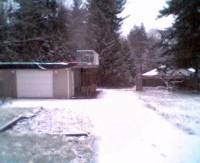 We continue to enjoy a peaceful snow coating in our neighbouhood - we tend to make a big deal of such things as we so rarely get snow on the coast. Kellei and I enjoyed a 45min Hike this morning through the forest park that backs off our property. It was so refreshing and peaceful - a wonderful start to the day. In work terms - I´ve mainly been working on completing the new SAR tracking module for the CCGA. I think I mentioned it here before but it´s nearing completion now and Starting to get very exciting. This new module forms a part of the http://www.ccga-pacific.org web site and will track all training and missions across the Pacific region - with links ties to tracking of all the units, people, and vessels used in the region. It´s the largest single code file I have ever written which is almost 10,000 Lines long now and still has lots of bells and whistles to go. Soon - there will be some public information available from it and as soon as there is I´ll Forward along a link. Finally it´s been almost one year since we released Scott´s Knots - the instructional video I put together with a friend of mine for teaching basic knots. The review have been fairly impressive and we are awaiting news currently from the American Sailing Association regarding their opinions - I´ll keep you posted there too.